How well does a Zone Read work when the opponent has six DL and two or three LBs stacked up close on short yardage situations? We have all complained about using a shotgun formation in the Red Zone, especially inside our own and the opponent’s five yard line. Imagine my surprise when I see us run an “ACE” formation for about 40% of the total plays in the last scrimmage held this last spring! (2011) As you see in the photo below, our formation of taking snaps directly from center is similar to the West Coast type of sets we ran under Bellotti, only the depth of the RB from the QB is DEEP, with no fullback, hence the name “Ace”. It reminds me of when Oklahoma ran a deep “Ace” like this for Adrian Petersen in 2005 as it allows the RB to fully see the field, pick the hole and hit it hard. It also allows us to force the defense to line up balanced, (because we are balanced in our formation) hence when we pull an Offensive Lineman—we can gain a numerical advantage on a side. I had been “sitting” on this Duck egg of juicy information for many weeks about a new formation, as I will not write about injuries or new formations unless Chip puts it out there for the world to see on ESPN, as he did in this Spring Game of 2011. In the photo above at 7:35 in the second quarter- we see Mana Greig pulling out from his guard position and beginning to go to his right as he eyes the Linebacker that he is going to blast. Meanwhile you see excellent blocks by his teammates on the White Defensive Linemen creating a hole inside between in the guard-tackle gap. We line up balanced, but by pulling an O-Lineman we create an extra blocker on the right side which pops a potential good gain. While it is a different formation, the Zone blocking is the same as what we would do with our “Power Play” in the Spread Offense. We see in the next photo above how Greig (#63) has tore into the LB and is about to pulverize a second defender coming up and with Golpashin (#70) and Armstrong sealing the inside—we have nice hole formed in the middle of the field. The WR is going to block down, (yellow line) and the RB Forde (#33) is going to burst through this hole, break a tackle, and head to open field. The last photo above of this series is an O-Lineman’s dream; look how the RB is breaking into open space. Observe where the blue arrows are as those are piles of Defenders plowed out of the way by our Offensive line. This is a finesse offense? I think not, as that is a classic Big-10 type of power football. It is IDEAL for inside both five yard lines and when we need to burn clock at the end of the game. The time to practice it and get all parties adjusted to it IS in the spring, and I am delighted to see this extra fly in the tackle box. We saw how you can gain big yardage with the Ace formation by pulling a guard and running inside the gut of a defense. 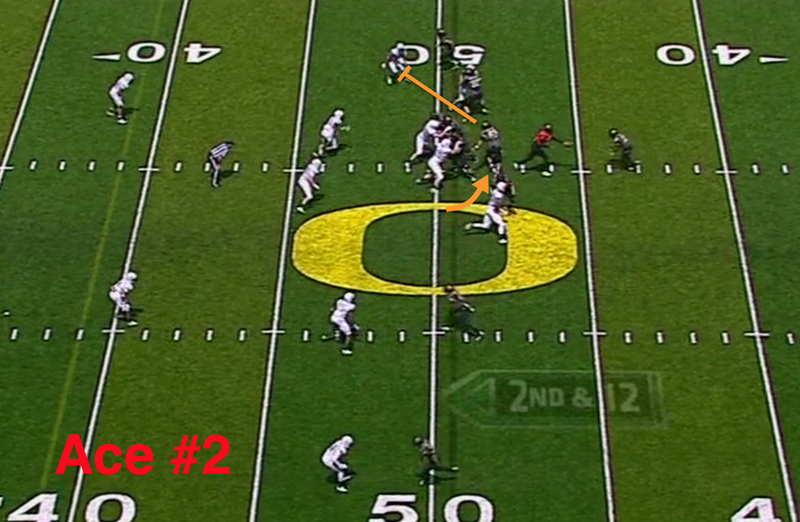 We also saw the Ace formation, with stretch blocking go outside at 3:32 in the first quarter. 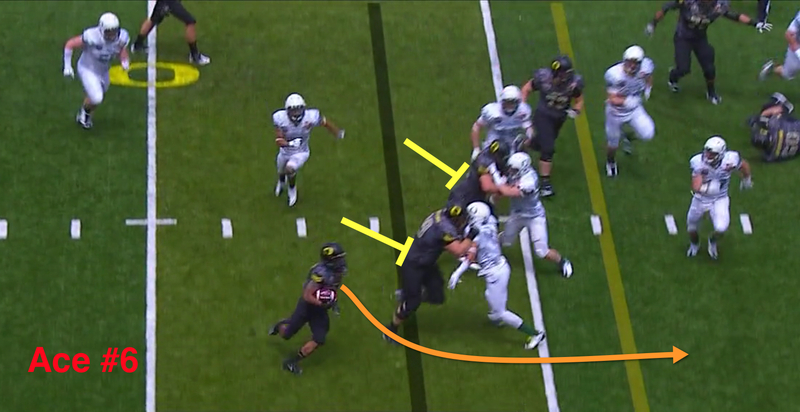 Note in the picture above how Darron is about to hand off to LaMichael James in this power formation, and how you see the center, Hroniss Grasu, (Blue Arrow) and the tackle Mark Asper, pulling to go outside to their right. Inside we see Golpashin #70 block the inside pursuit from going outside, and we see a WONDEROUS block by Colt Lyerla (RED ARROW to #32) on the DE, which is crucial to seal him from going outside. If the DE defeats that block, he can string the play to the sideline for no gain, hence the TEs block can make or break this play. We see the play progress above as Grasu and Asper have pulled and hustled outside and made contact on the LBs, thus opening a lane down the sideline for LMJ to run. Colt is out of view as he has buried his man in the pileup of defensive bodies. 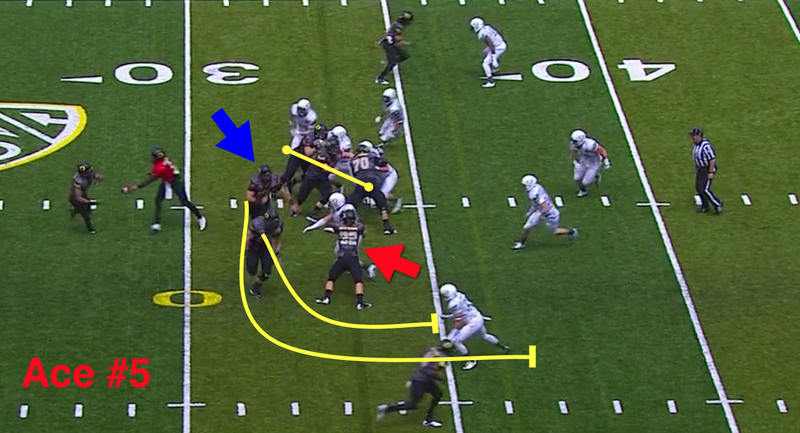 The final aspect (above) to create a Touchdown is the outside blocking by Tuinei (red arrow) on the corner, and James has to make one defender miss, as he does with his speed through the hole. From this formation we can line up balanced, but overload a side either inside or outside as we’ve seen from the Spring Game to run the ball effectively when needed. Is this a new offense? 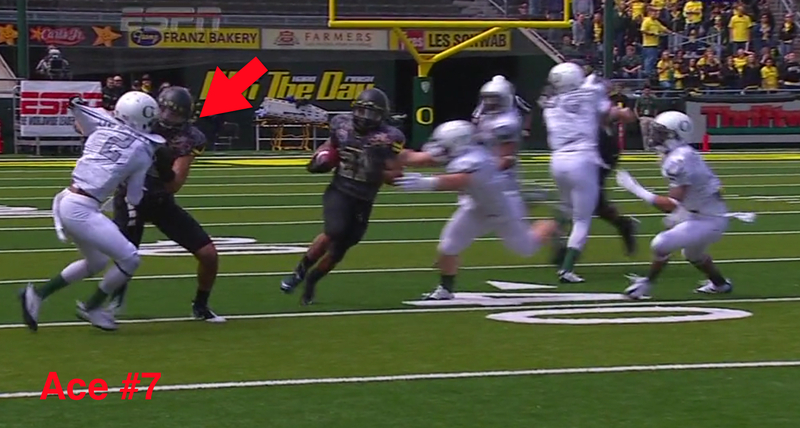 No, it is another option Coaches Kelly and Helfrich have as the game dictates. The concepts of pulling are similar to blocking schemes we already have and the letting the RB pick his hole is also similar to what we already do with the Zone Read plays. It’s a new component to the offense and WE LOVE IT! What is another surprise? As big as impact as the new Ace formation and plays? 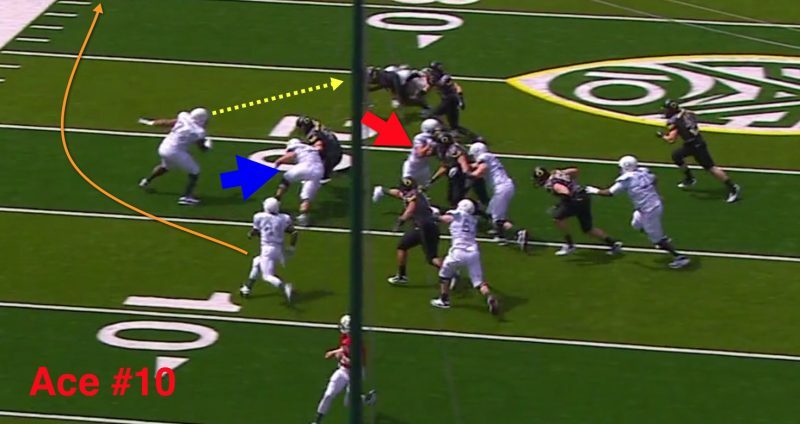 I could hardly believe my eyes as I saw Hroniss Grasu (Yellow arrow above) pull from his center position and nail a LB outside to pop LMJ for another five yards! We haven’t had pulling centers since Max Unger! When did this start again? What we see now (above) is Weems (#74) pulling to his left, but also the CENTER, Armstrong (#78) pulling! I could not believe my eyes as I saw both centers in Grasu and Armstrong pulling to block outside in this game. We haven’t done that in three years and now we have TWO centers who have the speed to do it? Note how all the interior Offensive linemen have the D-linemen superbly engaged, and how Paulson, (#42 & the Red Arrow) has the crucial sealing block to keep the defensive linemen INSIDE. Weems and Armstrong are using their speed to get outside quickly before the defense can catch up. Look above how Paulson has done a magnificent job (Red Arrow) sealing the inside and keeping the defenders bottled up. Karrington Armstrong (Blue Arrow) is showing how to nail those defenders out in open space, and thus begins to create a lane for Barner (#24) to run down the sideline. (Orange Arrow) See how Weems (Yellow Arrow) has used his speed to get outside and now he is preparing for his obliteration of anyone in his way. Wow. I worked with this picture above for awhile and yet when I pull it up later—I still hop in my chair. That is MAN-BLOCKING out there as we see the greatest evidence of Armstrong’s block, (Blue Arrow) being a heap of jerseys on the turf. Look at what Paulson (Red Arrow) has wrought—nothing but a mound-on-the-ground. Darrion Weems (#74 & Yellow Arrow) is in the middle of a major hurt on a LB, and a moment later he stretches out his body and blocks a second defender for a two-fer. 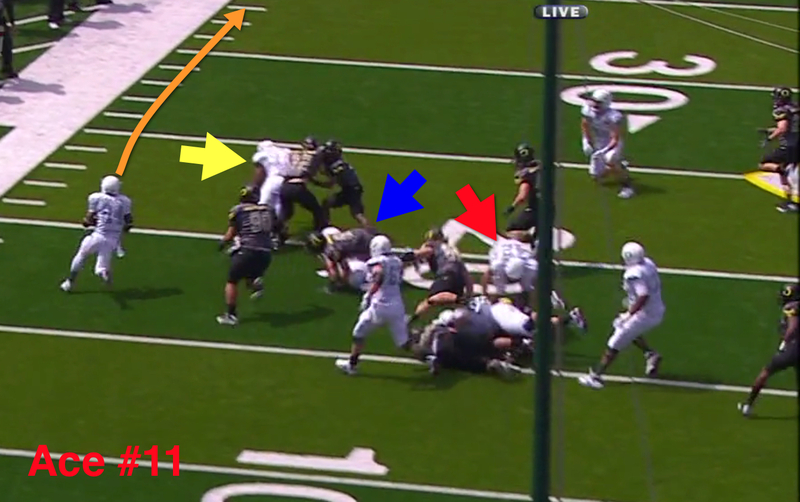 It creates an easy lane for Kenjon to run and he picks up a huge gainer with only one man to beat for the TD. Holy Crap that is great blocking! 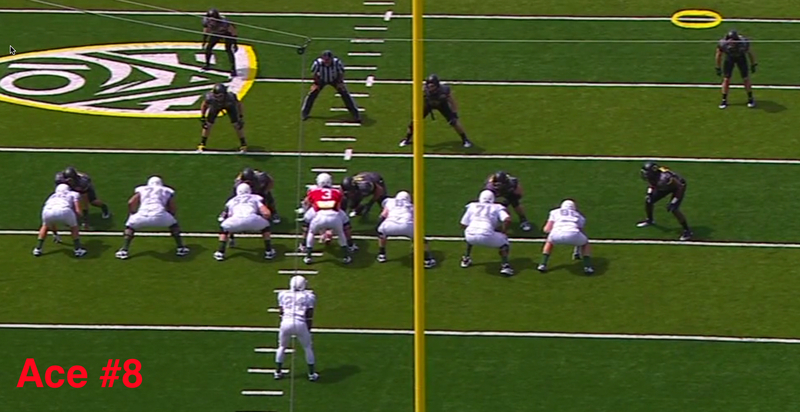 This is not a subtle change, as this can impact the entire offense. The center’s lack of size creates speed and agility on the edges to give us an extra blocker in open space that we previously did NOT have. Having centers that can pull, get to the edge, and crush a LB gives us a huge edge running outside, and defense will immediately have to react as soon as they see the pulling center. The over-pursuit outside will create enormous gaps INSIDE, thus if the edge isn’t open, the RB can make massive cutbacks the way we saw JJ and Snoop do in the past. The defense must quickly offset this advantage in blocking numbers on the outside which will make them vulnerable to play-action passes. In other words—the speed of our centers and their athleticism to block in the open on the edge improves our offense far beyond simply one player. It is a huge development. Oh how we do Love Our Ducks!